Size 4. The leather is generally in very good supple condition. There is some light overall scuffing and additional surface wear on the right earpiece and exposed seams. Good straps and all press studs retain the majority of their original brown coatings. The chinstrap has some elasticity and strong colour. Zipped earpieces with fully functioning zips. The helmet lining is cleaner than the average helmet with only light soiling. Fitted with a reasonably flexible but crusty pair of RCAF foam rubber cushions. Wired with an excellent mid tan coloured loom alhtough the black cased jackplug has some chipping around the rim. 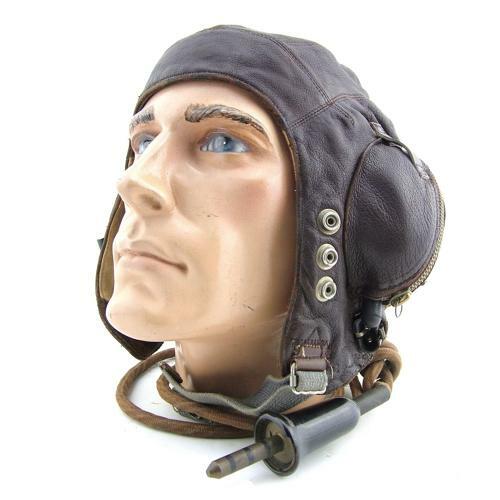 No receivers fitted but the helmet retains the original rubber carriers c/w fittings for Gosport comminication tubes. A very good used example in the largest size. Stock code H22362.